During a vessel’s voyage at sea, there are many dangers which may affect hers and personnel’s safety. One of these hazards, which may rapidly lead -at the worst case scenario- for vessel and human life loss, is ship flooding. In February of 2013, a severe leakage occurred on a container vessel while she was loaded with general cargo in about 14,000 containers and was about to pass southbound through the Suez Canal. 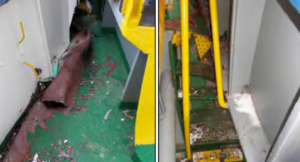 The leakage was caused by a mechanical break-down of a stern thruster situated at the aft part of the vessel’s shaft tunnel whereby the shaft tunnel was flooded. The bulkhead between the shaft tunnel and the main engine room could not withstand the hydrostatic water pressure and eventually the main engine room was also flooded. The situation became complicated because the vessel had just initiated a passage in a convoy through the Suez Canal. Loss of the vessel’s own propulsion, electric power, steerage and maneuverability could be foreseen and eventually occurred. The main technical sequence of events were a break-down of the forward stern thruster causing a major leakage into the shaft tunnel, a collapse of the watertight integrity of the bulkhead between the shaft tunnel and the engine room, primarily caused by non-effective cable penetration sealings and some undesirable properties of the bilge system and the emergency bilge suction from the engine room. Throughout the course of events, all officers and crew members were constantly disturbed and highly stressed by the sound of countless alarms, which made it extremely difficult to concentrate on the many challenges that appeared. Despite a series of technical breakdowns and system weaknesses, the shipboard organization remained resilient, and despite the breakdown of the structural barriers, the ship’s officers and crew managed to contain the emergency situation and bring the ship alongside at the Suez Canal Container Terminal without any personal injury or pollution to the environment. 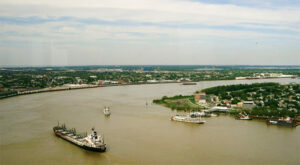 SQE Marine has prepared a detailed checklist aiming to provide the necessary steps required, in case of ship flooding.